Originally from South Carolina, Captain Taylor graduated from the University of Georgia with a Bachelors of Science in Biology in 1989. He matriculated to Mercer University School of Medicine where he was awarded a Medical Degree in 1993. CAPT Taylor completed his residency in General Surgery at Carolinas Medical Center in 1993. In 2005 CAPT Taylor was selected to complete a fellowship in Plastic and Reconstructive Surgery at Duke University Medical Center. 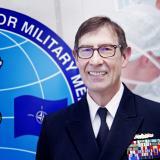 CAPT Taylor was assigned to the US Naval Hospital in Okinawa after completing his general surgical training, initially as a staff surgeon, but was selected as Department Head in 2002. During his tour he deployed extensively with both Fleet Surgical Team Seven and 3rd Medical Battalion supporting both their training and operational missions. CAPT Taylor was assigned as the senior medical officer and surgeon with a surgical team deployed on the USS Cushing with the prototype of the current Mobile Surgical Shipboard Suite. He also earned his Surface Warfare Medical Department Officer Qualification while stationed in Japan. CAPT Taylor was transferred to the National Naval Medical Center in 2003. He served as a member of the teaching faculty and held the position of Assistant Professor of Surgery. He was deployed with the Expeditionary Medical Facility Portsmouth in 2005-2006 as a General Surgeon where he was instrumental in developing the elective surgical program at the US Military Hospital in Kuwait. After completing his Plastic Surgery training in 2009, Taylor was assigned as a staff plastic surgeon at Naval Medical Center Portsmouth. In 2012 he deployed to the NATO Role 3 in Kandahar, Afghanistan as the Director of Surgical Services. He returned to the Role 3 in 2014 where he served as the Executive Officer. In 2017 he was selected as the Branch Chief of the NATO Centre of Excellence for Military Medicine Lessons Learned Branch in Budapest, Hungary where he is currently serving. CAPT Taylor is a member of the Alpha Omega Alpha Medical Honor Society, a Fellow of the American College of Surgeons, and a member of the American Board of Plastic Surgeons. He is Board Certified in both General and Plastic Surgery. His personal awards include: Meritorious Service Medal, Navy and Marine Corps Commendation Medal (three awards) Army Commendation Medal, and the Navy and Marine Corps Achievement Medal (two awards).